Recently, whilst trolling through the myriad cable channels available to me, I happened upon one of the hallmark films of my childhood, the 1973 animated version of E.B. White’s Charlotte’s Web. 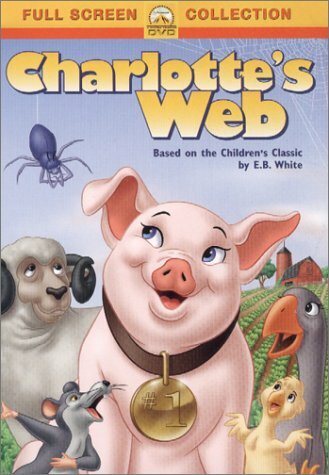 While I am apt, in my adult life, to quote from this film more times than I usually care to admit (“It says CRUNCHY”) it had been some time since I had actually WATCHED the gentle little saga of a frightened pig named Wilbur and Charlotte, the spider whose life becomes dedicated to preserving the safety of her friend. Anticipating clichéd retro delight in being able to relive memories of the gluttonous rat, Templeton, as well as rousing karaoke renditions of “Zuckerman’s Famous Pig,” I was caught unaware in my realization as to how much Charlotte’s Web had informed my childhood self about the then very-adult ideas of kindness, loss, and mortality. Granted, there’s plenty of sweet-natured humor and a healthy smattering of vocabulary words (“radiant,” “humble,” and “Smorgasbord” were all knowingly dropped into many of my youthful conversations), but beneath the film’s pork-pink exterior beats the heart of something far greater. More than merely a cartoon, Wilbur’s tale presents parents and children with an opportunity to understand and discuss the machinations of their world and the importance of staying true to themselves in spite of oppositions they may face. It’s heady stuff, no doubt, but crafted in such a way that the film never talks down to kids, but rather, with care and respect. While it may be true that, as a child, I was as equally enamored with Scooby Doo meeting Sonny and Cher (what a great episode! Zoinks!) as I was with Charlotte’s Web, the impact Wilbur’s story had upon my life far exceeds that explosive alignment of the stars. Sure, the beat may go on, but in the end, there’s no denying that is some pig. For the father who has one too many ties, here are some “bright” ideas to replace the stereotypical gift this year. Swap out the outdated lamp sitting on his nightstand with these cool, novel lamps. These gifts are technologically advance, but unlike the iPad or Kindle, no setup is required. That means he might actually put it to use sooner than later. And he won’t be calling you in the middle of a client meeting asking you how to sync his data. As a neat freak, this light made me do a double take. Get a towel, quick! Someone spilled my drink! This Pouring Light lamp is designed by Yeongwoo Kim. The cup serves as a lampshade while tea is suspended in time, defying gravity. You can’t see it in the picture, but there is a tea bag hanging from the handle that operates as the on/off switch. 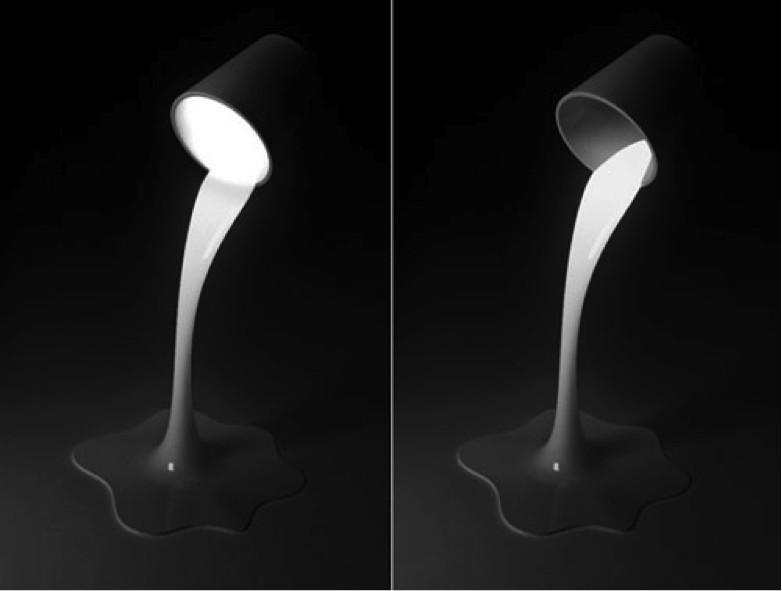 The lamp uses LED lights that are situated in the bucket, and with the help of phosphorescence in the “water”, it lights up in an interesting way. Now, for my next trick, I, Houdini, present you with the Silhouette floating lamp. “The Silhouette design is based on the iconic table lamp. It contrasts ultramodern technology with an almost antique appearance”. Designed by Angela Jansen, a classic, handcrafted lamp is brought into a realm of magic and mystery. The high gloss black finish adds charm and shine. 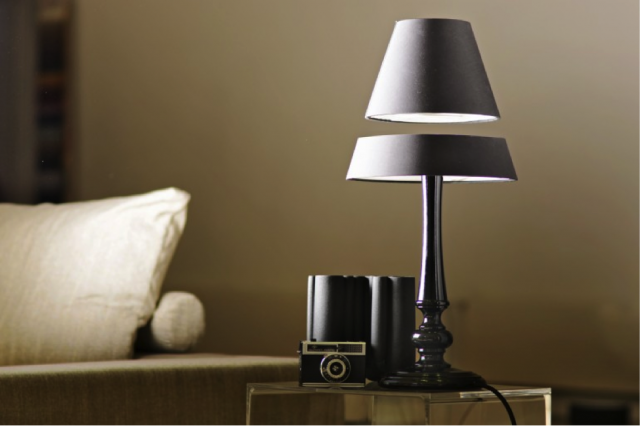 The lamp is supported on a wooden base and illuminated using LEDs. It is able to float using electromagnetic components in a sophisticated control system. The intensity of the light is dimmable with the touch of a finger. So if dad doesn’t want it, it would be perfect in a nursery. Brookstone and Spencer Gifts have nothing on these lamps. Or let’s go back a few centuries, and just stick with timeless light bulbs. They never go out of style. As much as I enjoy the latest gadgets, I always end up back to classic pieces like these. 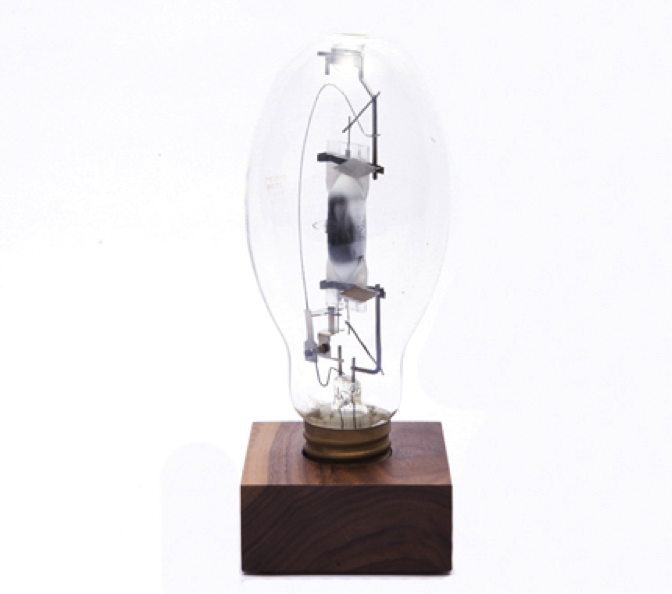 Just as Thomas Edison had envisioned, this decorative vintage factory bulb sits on a 3.5” walnut base. It’s easy on the eye, and offers no illusions or games. The lucidity of the bulb openly conveys the mechanics of how electricity works.